This is a compilation of postings about my knife-making and metal-craft projects. 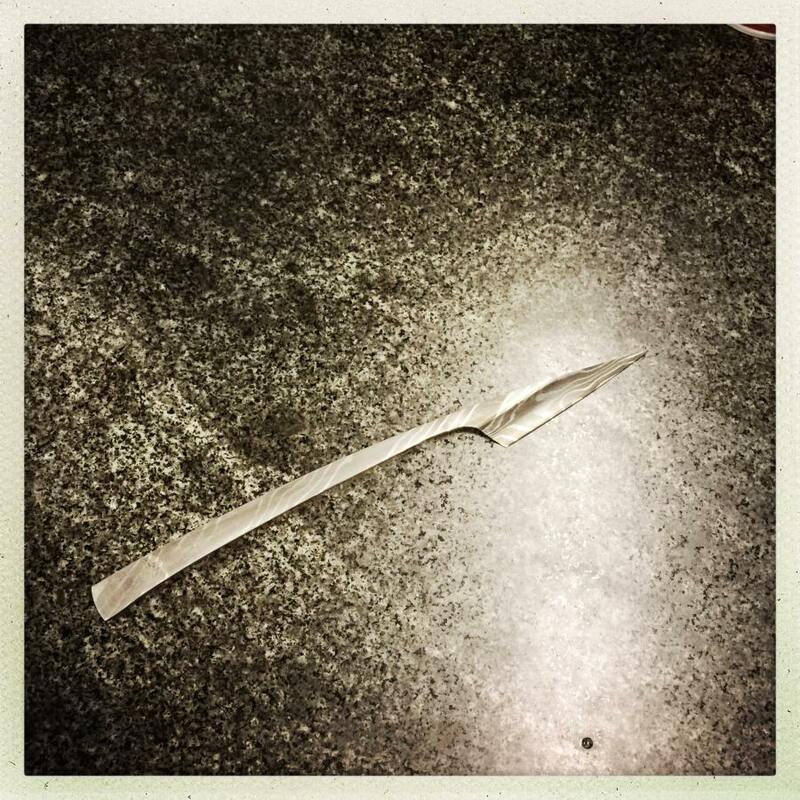 I made my first knife (a “prison shiv”) when I was in high school 40-something years ago. In college I designed a grinding machine and did a few stock removal blades including a medieval misericorde, a fairbairn-style dagger, and a fantasy-style large fighting knife with way too much brass on it. Back around 2008 I discovered Jantz supply was selling pretty nice san mai Japanese-style knives, and made sets of knives for a few friends. In 2017 I went to sword-making class at Dragonfly Forge [stderr] in Oregon and made a Japanese-style wakizashi. It has been a life-long dream to be able to do hot metal forging and finally I decided, “why not?” It seems like knife-making has become a popular thing lately, but I don’t care – I just like the pretty sharp things and the problem-solving. I probably like the problem-solving more than all the rest of it put together. 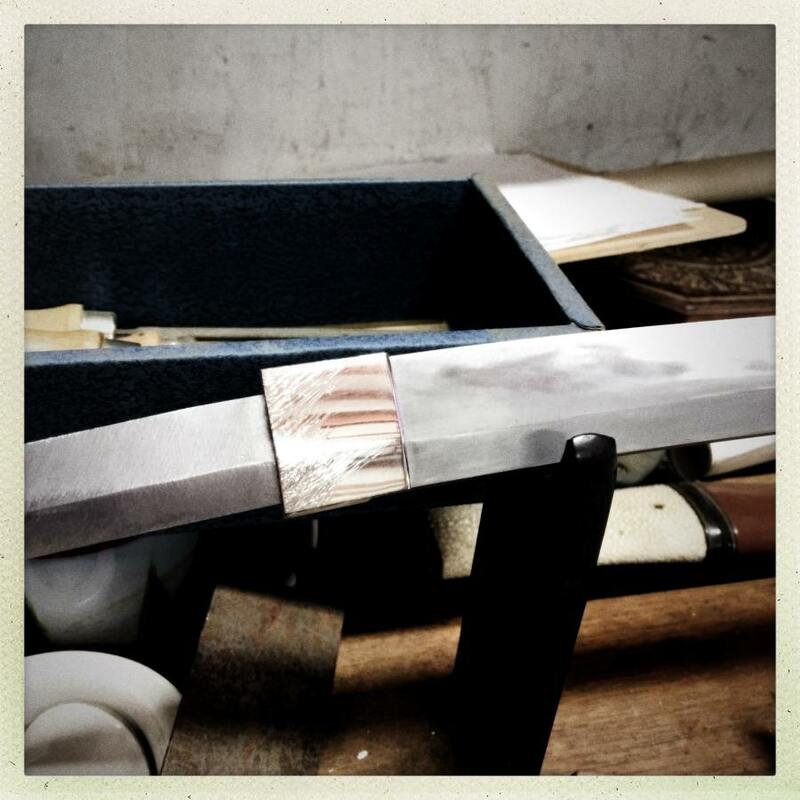 On the Bench – transferring outlines of blades to metal, some blade blanks. Bits and Pieces – welding multi-part bars and the time-wasting threat of bad welds. Hanging Out In Bars – multi-layering wrought iron and 1095, with a whiff of nickel. 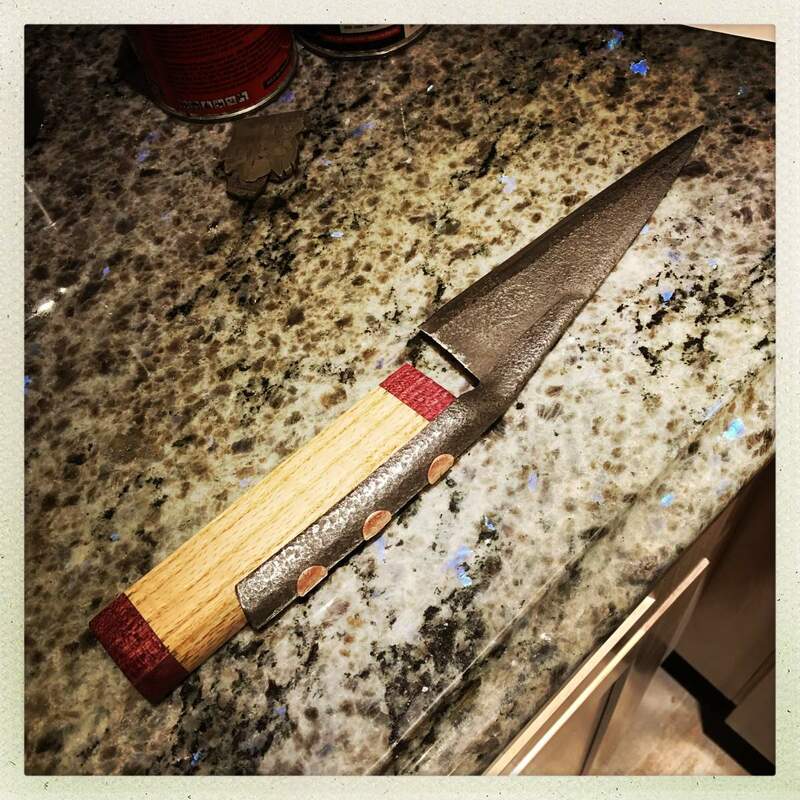 More Metal – “scalpeldashi” cable-faced ni mai utility knife. Learn From My Fail – an extremely embarrassing screw-up. Unknowns – I am worried about carbon fiber. Jazzlet’s bread-scoring knife – a simple scalpeldashi with a swoopy flair. I own an old elementary school. 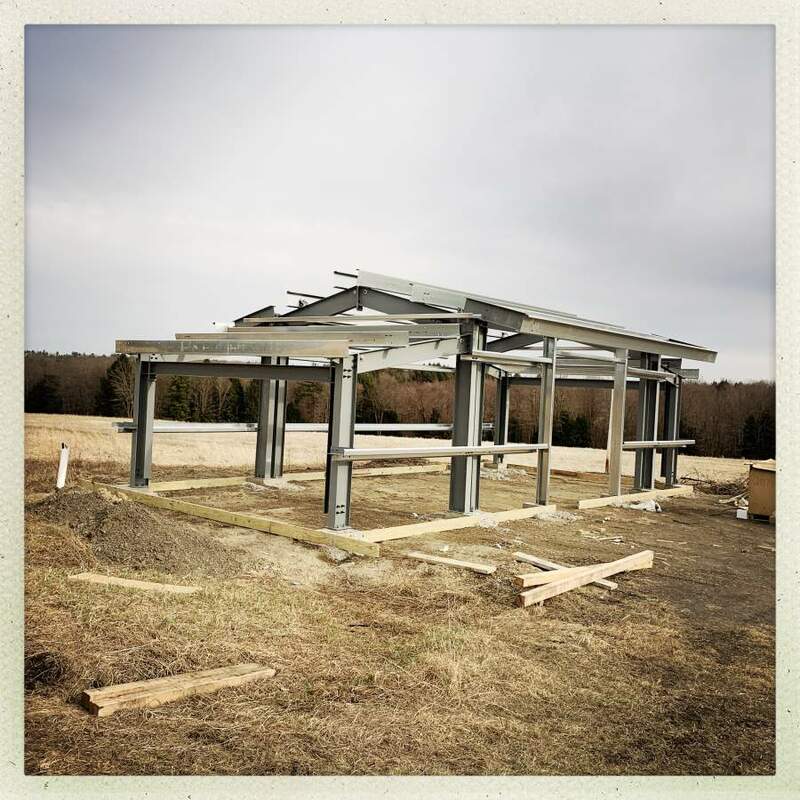 Yes, I know – the very idea is ridiculous – but out here where I live, real estate is cheap. I paid an embarrassingly small amount of money for the place and have been using it as a project home, shop, darkroom, and fortress of solitude since 2005. Old To New: beginning the clean-out on the room that will be the forge. Prior to its designation as “forging room” it was being used as general purpose wood and stuff storage; i.e. : junk. It took 3 dumpster-loads to clear the room, and take down and dispose of the dropped ceiling. Old To New 2: Pulling down dropped ceiling. Dumpster-loads! Wiring: The joys of running wire and patching new wiring into 1957 vintage circuit breaker panels and un-grounded wall conduit. 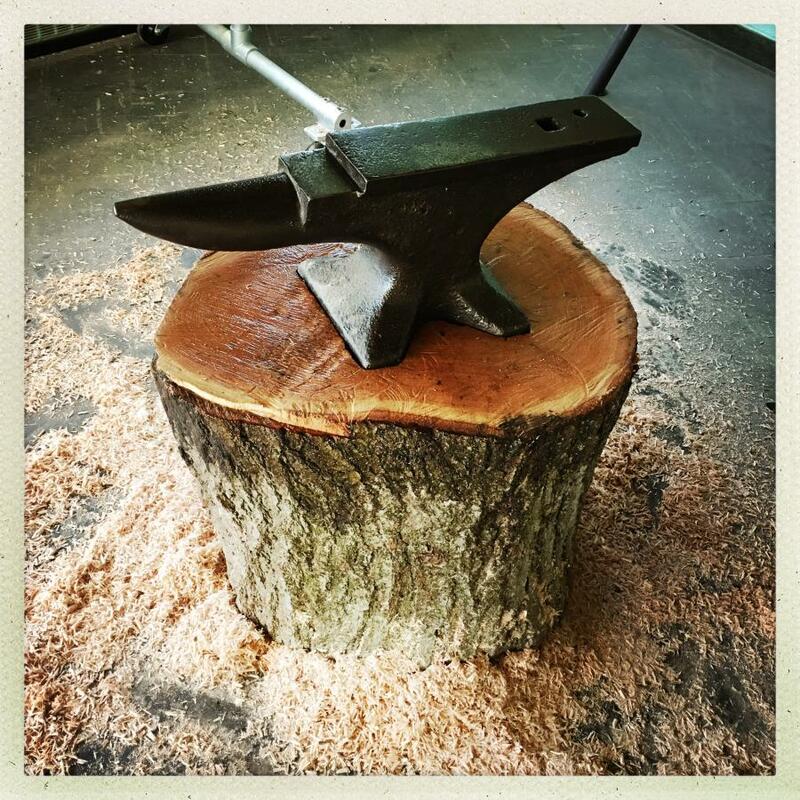 Anvil Stands: My neighbor was cutting down a Mighty Oak Tree; I got a few slices. 600lb worth. Hammers: I got Michael Hoops to make me a pair of forging hammers out of beauty, steel, and moonbeams. Forging Press: Coal Iron Works made me a beautiful 16-ton press in baby pink. And the trucking company delivered it 100 yards downhill and down some stairs from my building. Shop Benches: I made my shop benches (grinding/assembly bench, and welding bench) using Kee clamp components and conduit from simplifiedbuilding. Heavy Metal – obtaining and moving an old surface grinder. Heavy Metal – obtaining and moving a vintage Bridgeport milling machine (Part 1) (Part 2) also building a sand-tray to surround the forge. Mounting a post vise – my welding skills go head to head against a piece of victorian iron. Dust control – the grinding room. 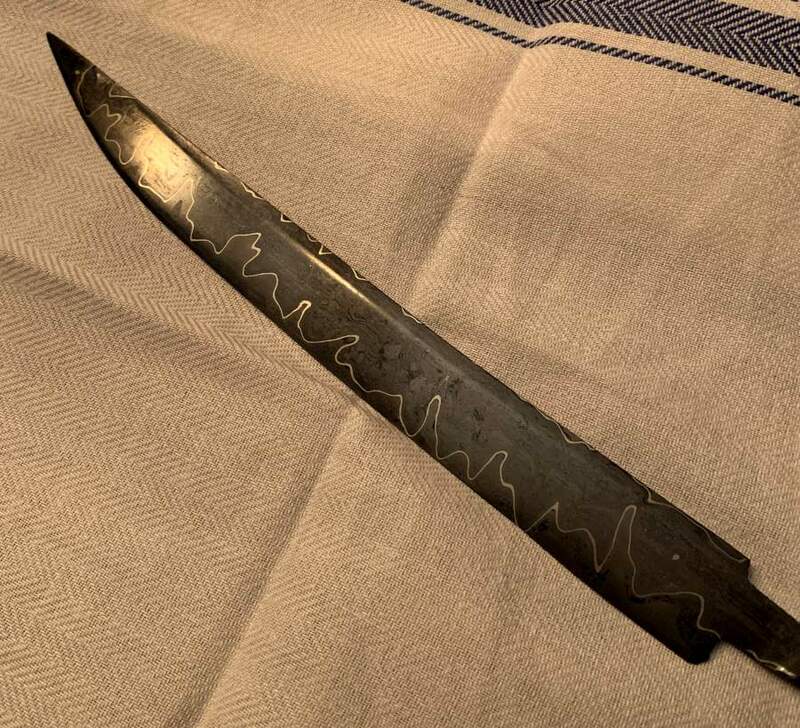 A few years ago I bought some really nice VG-10 core/damascus san mai blades from Jantz supply. I did some re-shaping on the backs and polished them, then mounted them in my “standard” set-up, which is a dense wood bolster and a hardwood handle, that somewhat looks like a traditional Japanese mount, but isn’t. Traditional Japanese mounts involve inletting the handle wood through a horn or plastic ferrule, then hammering the blade in to the wood to set it. My approach involves inletting the blade through a front-block then the handle, gluing the whole thing up, and shaping it. A Knife Mounting 1: Inletting and glue-up – setting up the mounting. Mold-making for knife-maker’s slabs – using silicone to make molds for your alumilite resin. Casting handle slabs – bones and shells and pinecones and gold leaf and whatever. Alumilite epoxy resin. Claymascus – experimenting with damascus patterns using modelling clay. Mokume Gane – successful experiment that nearly caused full-body combustion. Straight Out of Sheffield – converting old sheep shears into a chunky, ugly, knife.